Cake candles are easy to make at home. Making cake candles is a fun way to give an ordinary candle extra appeal. Cake candles are often found in expensive boutique gift shops, but you can make your own at home for a fraction of the price. What Is a Cake Candle? Cake candles are candles that have been coated with a layer of whipped wax. They get their name from their "frosted" appearance. Cake candles are sometimes referred to as primitive candles, but the two terms are not interchangeable. A primitive candle is a candle that has been rolled in herbs, dried flowers, or sand before being dipped in a final layer of wax. These candles have a textural appeal that is very similar to a cake candle. However, the process of making a primitive candle is a bit riskier because you are adding ingredients that could catch fire too easily. Although many crafters prefer to make cake candles with pillar candles that they have created themselves, you can also try making cake candles using purchased candles in your favorite scent. This is a great timesaving shortcut if you're looking for an inexpensive handmade gift idea. Look for pillar candles at your local dollar or discount store for the greatest savings. The technique for making cake candles is fairly simple, even if you're new to the craft of candle making. However, it's important to remember that candle making is a craft that requires careful attention to safety precautions. Keep children and pets out of your work area and never leave melting wax unattended. Melt your wax in the double boiler. Use a medium or slow setting and stir regularly. Add fragrance to melted wax if desired. Remove wax from double boiler and allow it to cool until a slight skin forms on the top. Whip the wax using the same technique you'd apply to making scrambled eggs. If done correctly, you'll have a thick and frothy mixture with several chunks. Many people describe the mixture as having a consistency that is a cross between cottage cheese and gelatin. Apply the wax to your candle using a fork. Tapping and spreading the wax randomly will create a rough appearance with lots of texture. If you want a more polished look for your cake candle, press the wax down with your fork or use a knife to smooth it out a bit. Allow the wax to cool completely before using your cake candle. Since they have a rough and almost antique appearance, cake candles tend to look best when burned in wrought iron candle holders. In addition, any crafters choose to accent their candles by adding hearts, rusty wire, or metal stars to the pillar for extra decoration. If you're giving your cake candle as a gift, present it with a wrought iron picture frame or a soy teddy bear candle in a coordinating fragrance. Cover a ball candle in whipped white wax to make a snowball candle for a unique Christmas decoration. 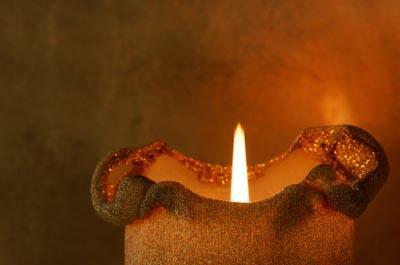 Use whipped wax to create a "sea spray" effect on a candle with an ocean theme. Add a frothy layer of whipped wax to the top of a candle made in a coffee mug.